Finland has one of the highest percentages in the world of population with access to the internet (97%), of which almost half (49%) regularly shops online every month - the vast majority of which is cross-border commerce (source). 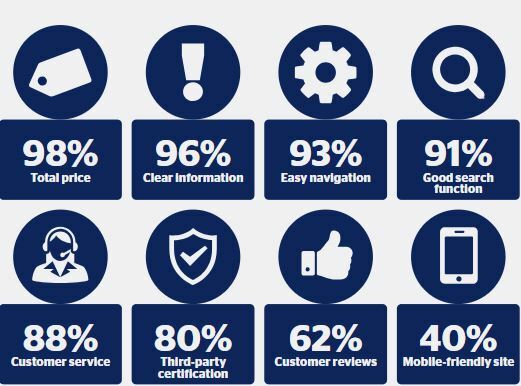 In this guide, get the details of e-commerce performance in Finland and what consumers look for when purchasing online. Although lower in terms of regular e-commerce customers in comparison to its Nordic neighbours, there is an increasing trend of e-commerce growth, with an expansion of 20% in the last 5 years (source) and user penetration in Finland is expected to hit 73.7% with 4.1 million online shoppers by 2022 (source). This high level of purchasing from abroad means there is a clear opportunity for retailers to acquire a customer base in Finland. Revenue in the "eCommerce" market amounts to US $4,875m in 2018. Revenue is expected to show an annual growth rate (CAGR 2018-2022) of 7.6% resulting in a market volume of US $6,526m in 2022. As we saw with Sweden, the market's largest segment is "Fashion" with a market volume of US$1,588m in 2018 (source). The combination of Finland’s low level of e-commerce experience and high proportion of the population shopping from abroad (46%) means that the distribution of market share is still very much up for grabs. In other words, up-and-coming e-commerce businesses from throughout Europe have solid opportunities to reshape the local market. clear pricing, clear product information, an easily navigable site, customer service and a multichannel strategy that utilises Finnish channel preferences. Due to the high levels of Finnish consumers that shop abroad, they have the lowest expectations among all the Nordic countries regarding delivery times. 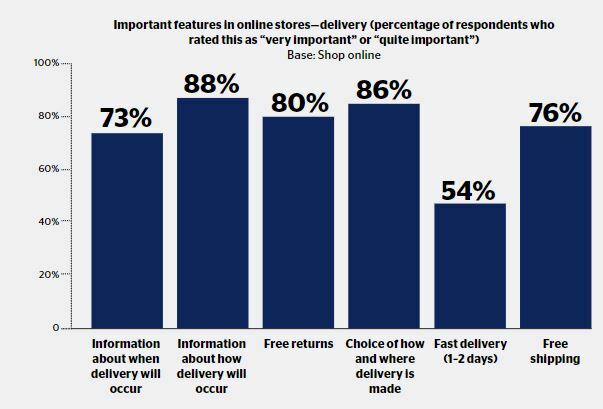 Accordingly, the percentage of Finnish online shoppers who consider it important to receive information about when their delivery will arrive is also the lowest of all the Nordic countries (see bar chart below, source). Shopping channels in Finland - which to use? Vertaa.fi is Finland's largest reference site where consumers can compare products based on price, delivery time and other customer reviews - with a dedicated base of nearly one million visitors a month. They list over 4 million products and generate leads for online shopping with "cost-per-click" pricing. As with any e-commerce channel, there are a number of fields required to be filled out in the product feed you export to Vertaa. These include: Category, name, price, brand product ID, delivery time, shipping method, delivery price and service country code - you can view the full list here. Get in touch with a customer success manager at WakeupData and we can let you know exactly what is needed to set up an fully-working, optimized integration with Vertaa.fi. Kelkoo is a comparison shopping engine which offers integrated services for online shopping, increasing online sales by advertising products through highly targeted ad placements across a network of premium publishers. Founded in 1999, they are now present across 22 countries across Europe including Finland in which it is one of the most implemented channels for e-commerce sales. Neccessary fields for your Kelkoo export the include unique id of each product, title, price, URL to your webstore and availability. Check out their full feed specifications here. The good thing is that you only pay when customers are redirected to your store from Kelkoo. You can use our pre-made template to create your Kelkoo product feed with WakeupData now and start selling. Prisjakt is a price and product comparison service on the Internet operated by Prisjakt Sverige AB. At Prisjakt (aka "hintaopas" in Finland), consumers can compare prices and characteristics of products as well as read other user reviews on products and retailers. Join one of the best price comparison services in northern Europe and benefit from a high-quality and up-to-date WakeupData product feed. There is a rapidly growing number of Finnish consumers want to shop online and are on the same technological level as the other Nordic countries. E-commerce is growing rapidly, the domestic supply is not enough, leaving untapped potential for companies from overseas to gain a foothold with carefully planned e-commerce strategies. Take the time to select which channel might be right for you. Check out their product categories to see if they support your type of products and consider carrying out a trial campaign to see if you get results. Find out more about WakeupData's tailored feed marketing solutions or follow the link below.